Well hello there. So. It’s been more than a little while since I last posted. 10 months to be exact. Things got busy, I planned a wedding, got married, went on a honeymoon and now, almost two months after The Big Day, I have recovered from the whole wonderful, exhausting experience just enough to get back in my kitchen and start documenting it again for you here, that is, if there are any of you left after my prolonged absence! The meaning of this blog’s name (balancing the healthy – apples - with the delicious, but not-so-healthy – butter) could not be any more pertinent in my kitchen than it is right now. Since getting married I feel I am fighting the constant battle of trying to find dishes fabulous and flavorful enough to keep my husband (my ever-so-slightly picky husband) coming back to the dinner table, while trying desperately not to regain those 10 culinary school pounds I managed to lose for the wedding. Fun times in the Stanbrook kitchen. Battle number one. Teach husband that chicken does not have to be flavorless diet food. Far from it! When cooked just until done (not to a dried out, parched mess of protein) I think chicken is absolutely delicious. However, properly cooked chicken does not, on its own, a fabulous and flavorful meal make. Enter the one-two-punch of a marinade and grill. The flavor of chicken cooked on a grill will always remind me of the Cornish game hens my father grilled for our family at least once a week when I was a child. Perfectly cooked, with just the right amount of char, it is quintessential outdoor living, Southern California food to me. Use the following dressing that pulls on some of the season’s best flavors (pesto anyone?) as a marinade and I think you’ve got the perfect summertime dinner. This dressing lives somewhere between vinaigrette and pesto. If you have extra basil, make as much of this dressing as you can and use it as a condiment for cooked meats or a salad dressing; toss it with freshly cooked vegetables or throw it over pasta. 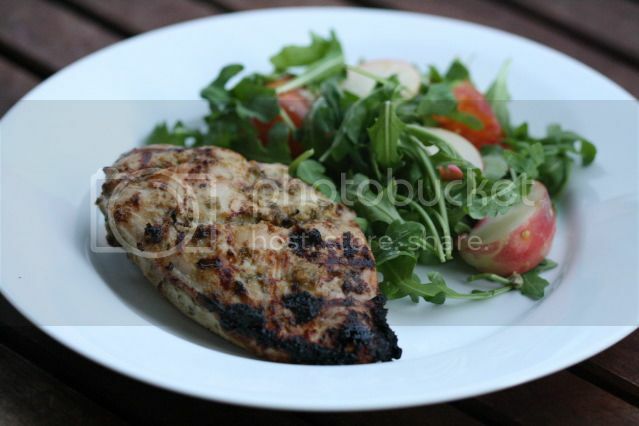 I have included directions below for using it as a marinade for grilled chicken breasts. Combine first six ingredients in a mini-food processor (or a regular food processor if you only have the full size) and pulse until combined. Add the olive oil and let the processor run until the oil has blended and somewhat emulsified with the other ingredients. I like to leave this dressing chunky, but if you prefer a smoother dressing, continue blending and add more olive oil until your desired consistency is reached. Taste and adjust seasoning. Using a sharp knife, make three slashes in each breast, only cutting about 1/8” to 1/4”-inch into the breast. Reserve 1/2 of the dressing to serve as a condiment for the cooked chicken or to use later as a salad dressing. Rub 1/2 of the remaining dressing over the breasts and let them marinate in the fridge for as much time as you can – 30 minutes to three+ hours. Fire up your grill. Let your chicken breasts start to come to room temperature while your grill heats up. Place the chicken on the grill and adjust the flames/charcoal to prevent flare ups. Close the grill cover and only lift it occasionally to baste the chicken with the remaining dressing. I wish I could tell you how long to cook the chicken, but every grill and every chicken breast is different. My chicken breasts were not gigantic and it took about six minutes on the first side and an additional four to five once I flipped them over. If your chicken is getting too black before finishing cooking, move it to a cooler area of the grill or a raised shelf and let it finish cooking with the grill cover closed. Serve the chicken with the remaining dressing. YAY! You're back! Can't wait to try this. It's great to have you back blogging and congratulations on your wedding! 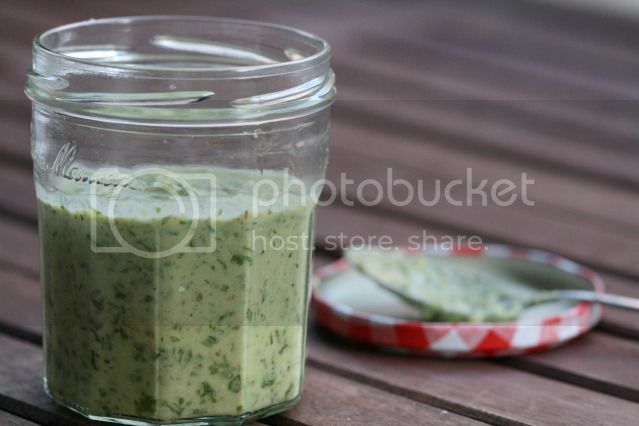 This pesto dressing looks delicious - so summery. YAY!! I'm so glad you're writing again. I love your yummy food blog. Welcome back! And congratulations! That marinade looks yummy. I was just complaining on my blog about not having a grill and having my mouth water at all the grill recipes on the blogosphere. Enjoy that delicious healthy food! What a year. Congrats and welcome back! Your creamy vinaigrette looks fantastic too. Be nice to see your post! Very very nice. Looks nice! My chicken breasts were not gigantic and it took about six minutes on the first side and an additional four to five once I flipped them over.